If you do not have a network device, this screen does not appear during your installation and you should advance to Section 17.16, “Time Zone Configuration”. 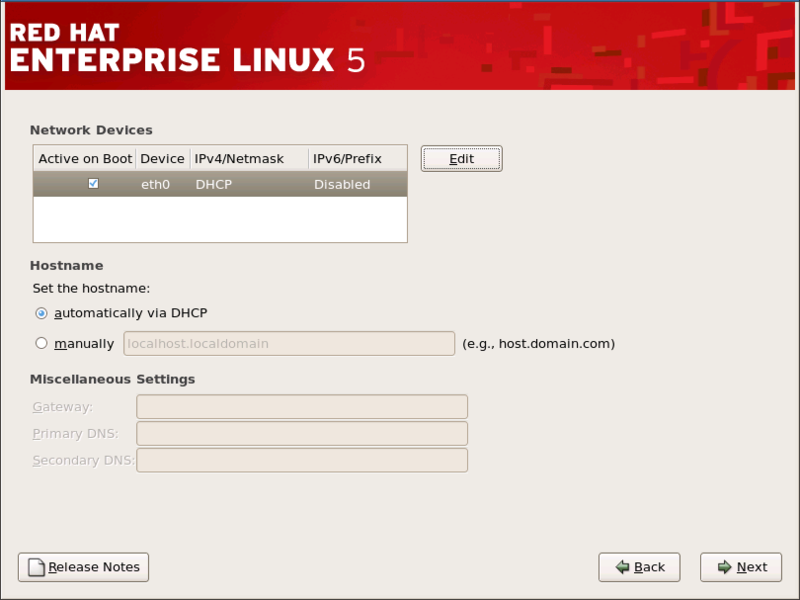 The installation program automatically detects any network devices you have and displays them in the Network Devices list. When you have selected a network device, click Edit. From the Edit Interface dialog, you can choose to configure the IP address and Netmask (for IPv4 - Prefix for IPv6) of the device to use DHCP or to use static settings. If you do not have DHCP client access or you are unsure what to provide here, contact your network administrator. DHCP should not be chosen for qdio/qeth devices that are configured with OSA layer 3 support. Layer 3 does not provide MAC address or Address Resolution Protocol (ARP) abilities and so can not be used with network services that require them. Do not use the numbers as seen in this sample configuration. These values will not work for your own network configuration. If you are not sure what values to enter, contact your network administrator for assistance. If you have a hostname (fully qualified domain name) for the network device, you can choose to have DHCP (Dynamic Host Configuration Protocol) automatically detect it or you can manually enter the hostname in the field provided. Finally, if you entered the IP and Netmask information manually, you may also enter the Gateway address and the Primary and Secondary DNS addresses.